The table below includes all the portfolios and are updated around once a week, so these values are not real time but pretty close. I have two brokers, one for my taxable account and one for my 401k. Nothing fancy here, any brokerage firm works. My buy frequency is a set of buys a month. I don't sell unless the business has fundamental problems. I am fully invested, or what some say "all in". Any cash on the side is instantly deployed when available. This is not a virtual portfolio. This portfolio and the results of it are deployed using hard earned cash that I spent many years accumulating. This portfolio is managed under my own strict interpretation of the dividend growth investing philosophy. The highest of high quality stocks have their Tickers bolded with Green and can only qualify for such ranking if they meet all 4 of these criteria: In the portfolio table below, Green Tickers signify what I consider "Core", Yellow Tickers are supporting positions, and Red Tickers are speculative. I consider companies to be Core if they have predictable earnings, are non-cyclical and anti-recessionary in nature, have wide moats, demonstrate predictable dividend histories, and have strong credit ratings. I call these my Elite collection of high quality stocks. I am always on the lookout to add to these at fair value or less. These positions make up the foundation of my dividend growth portfolio since I do not see them going out of business anytime soon. There are definitely other Core positions in my portfolio, but they do not qualify for the Elite status because they have lower safety or lower credit rating. There are also companies that meet the first 3 requirements from S&P and Value Line, but are not what I consider Core due to their business model. 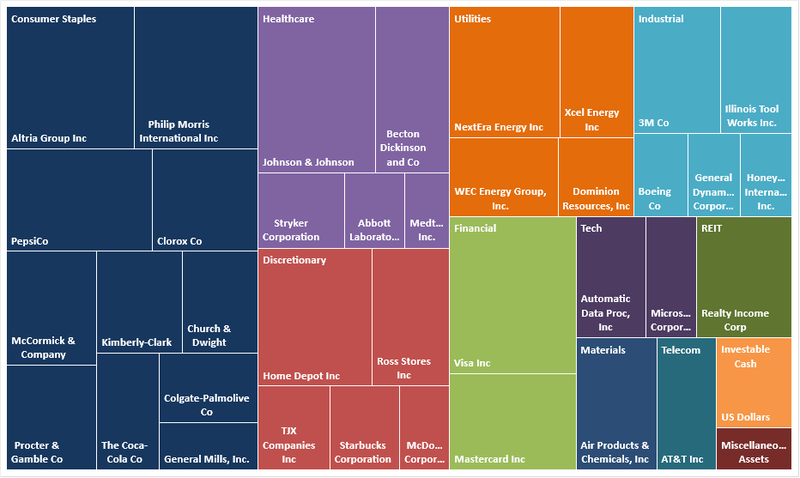 As a result these companies, although high quality, are labeled as Supporting or Speculative. The portfolio does not include depreciating assets like cars, furniture, or clothing. Right now I own no real estate. The miscellaneous assets are my assets that are not company stock. These will require on average 30 days to liquidate and the value presented includes the fees involved from selling. Awesome graphs YD! Pretty impressive portfolio too! I like seeing your sector weights. It's a quick and easy visual on where your holdings are. Keep it up! Very inspiring! Very impressive portfolio! We share a lot of companies in common, making it a solid foundation! Goodluck on your success! Bravo! Excellent depiction of your portfolio! Nice looking portfolio with quite a few names in common with mine. Thanks for sharing. What service do you use to make these charts and graphs? I use Excel to make my graphs and charts. Glad I found your blog, this is a great portfolio and great charts! Wow amazing portfolio! I hope to one day have a portfolio such as yours. We have a lot of similar companies as well. Thanks for sharing! Hey Young Dividend, keep up the good work. What is your plan into retirement age? Take from taxable and move into Roth? I'm curious of your plans related to RMDs (Required Minimum Distributions) at age 70 1/2. Interesting! Great to see others spread risks. First off, I would just like to say thank you in advance for the material and road map that you will potentially provide your followers over the coming decade, as I am in a very similar position. I am also in my mid-twenties, having recently found my "career", and extremely interested in where I should be putting my money (maxing my Roth IRA, maxing 401k company match, etc.). I just have one question (for now): how did you justify and form the opinion that the foundation of your portfolio should be based on dividend reinvestment? The reason I ask, and you may or may not have a similar hypothesis, is that there is more uncertainty around growth stocks in 2017 than in the past. What's even more peculiar to me is that you work in Silicon Valley, where growth companies are supposed to be dominating, and you still have come to the conclusion that a dividend reinvestment portfolio is the best plan for yourself over the next decade. Maybe on a longer time horizon you would have more growth names, idk. That being said, I have been mulling this dividend strategy for about six months now, having dabbled in growth names and not exactly enjoying the volatility or valuations. I plan purchasing quality companies with high dividend yields in 2017 and beyond, having a very similar strategy to what you have documented. Technology grows fast but I don't need that type of goals to achieve what I need. Most don't pay a good dividend either. I just want income to live off of that is consistent, share price is secondary. Great looking graphs. Beautiful job you're doing with your portfolio! Thanks. How do you manage the reinvestment of the dividends/distributions? DRIP or do you have the dividend sit as cash then make individual purchases selectively. Thanks. My broker can allow dividends to be received in cash or instantly reinvested back into the company that paid them. I just turn it on that way. Interesting portfolio and great visualizations! I see that you have marked SBUX as speculative. Why so? SBUX is becoming more like MCD as they mature. So I will likely take it off speculative. I bought it a long time ago. It was still a very much growth type company with a low dividend yield. Excellent Profile!!. Might I understand just how much more money have you been placing in to your own profile every month?? Recently i simply began my personal dividend development profile as well as my personal weblog. It isn't performing which nicely right now because the general marketplace is actually lower. Nevertheless I'm by using this chance to buy much more dividend development shares. I put around 63-65% of my after tax income into my investments. The rest is spent on living and misc entertainment expenses. If one invests in the similar manner I am, the absolute dollar number growth on the Y axis will be different but the overall % growth over time will still be the same. It's important to start early regardless if you are in a high or low income. MSFT weightage can be higher, and some key stocks like TXN, LOW can be added. MSFT has been a good investment for me and I slowly have been increasing it over time. I am still looking for additional technology companies to invest in but most do not pay a dividend. I'm Zari, a Japanese man, investing US stocks and ETF from Japan. I happened to find out your blog when exploring the Internet and was so inspired by your posts. I'm very curious and keen to know how you have created the top table, which shows stocks you own and its percentage. I would like to create it for my own portfolio, so it would be appreciated if you could share with me how to make it or the web link you referred to. I use Excel to make my tables. I don't have a tutorial unfortunately or a web link to download the spreadsheet. Just curious in regards to utilities, you don't have any ED or SO? I prefer the growth metrics of the other utilities I own compared to ED and SO. Out of those two I prefer ED. No way is Starbucks a red and speculative. Make it GREEN!!! !